U.S. Gold Gymnastics specializes in the fundamental development of the preschool and the elementary student, which provides a solid foundation, acting as a catalyst for many other sports, academic pursuits, and lifelong endeavors. 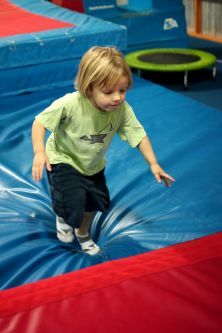 We have two recreational facilities which focus on the basic and introductory training levels of gymnastics and tumbling. We also have a private Team Training Facility dedicated to our competitive gymnastics through Level 10. We offer classes, private lessons, birthday parties, host Kids’ Day Out and Kids’ Night Out every Friday, and participate in community outreaches. We service over 1,000 families a week in both the Destin and Crestview areas. Gymnastics is one of the most comprehensive “lifestyle exercise programs” available to children, incorporating strength, flexibility, speed, balance, coordination, power, and discipline. Children learn cognitive skills more effectively in an environment that includes the body as well as the mind. Gymnastics, childhood movement education, is directly attributed to developing students and promoting reading readiness. Children who have participated in movement education activities have longer attention spans, increased communication skills, general problem solving skills, and improved self-esteem.